Whether the course launches in a new window, and if so, the characteristics of that window. To set your options for these things, you'll need to open the Player Properties window. 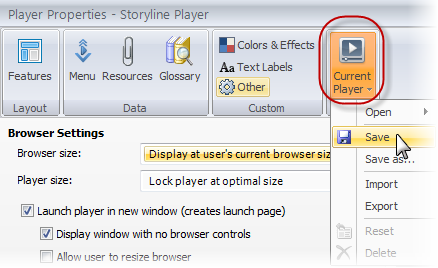 First, click the Home tab on the Storyline ribbon, and then click Player. Now set your preferences, using the guidelines below. 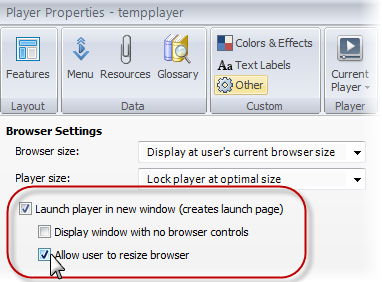 Display at user's current browser size: With this option, when the course launches, it'll display in a browser window at whatever size the learner's browser is currently set to. 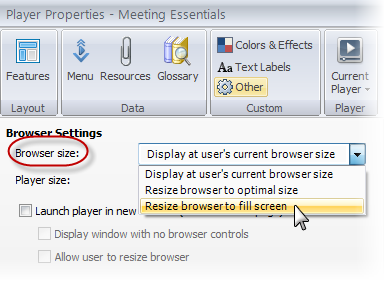 Resize browser to optimal size: If you choose this option, when the course launches it'll automatically resize the learner's browser to match the course's optimal size. The optimal size is whatever you've chosen as the story size, plus any additional height or width to accommodate the course player. Depending on the features and controls you've included on your player, the player can add between 20 and 260 pixels to the width of your course, and between 20 and 118 pixels to the height. If you need help understanding the features and controls available on your player, check out this tutorial. Resize browser to fill screen: If you choose this option, when the course launches, it'll automatically resize the learner's browser to fill the whole screen. Scale player to fill browser window: This causes your published course to fill the user's browser window. 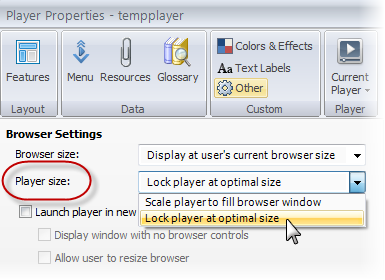 Lock player at optimal size: This locks the published course at its optimal size—and even if learners resize their browser window, the course itself will stay at the optimal size. The optimal size is whatever you've chosen as the story size, plus any additional height or width to accommodate the course player. Depending on the features and controls you've included on your player, the player can add between 20 and 260 pixels to the width of your course, and between 20 and 118 pixels to the height. If you need help understanding the features and controls available on your player, check out this tutorial. Display window with no browser controls: If you mark this, the new window in which your course displays will have no browser controls — it'll only display the address bar, which won't be editable. If you leave this box unmarked, the new browser window will have the usual controls that the learner uses on his or her browser. Allow user to resize browser: Mark this if you want your learners to be able to resize the browser window in which your course launches.